2019 is going to be an exciting year in the Guild! Here’s the schedule of speakers and workshops for our monthly meetings. Details will be posted in the Calendar and in Knitters News as they become available. 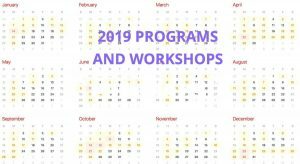 Program and Workshop info is always available on the website — Programs and Workshops. See all Guild Calendar events in a jam-packed January here. « Missing Library Book – Found!